Molkky is an extremely fun outdoor lawn game that has a permanent spot in our backyard games collection and the Ultimate 63 Outdoor Games list. Also known as KLOP, Molkky is a game of both skill and luck that you can play with a drink in your hand. Created in 1996, Molkky is one of the top rated European outdoor games. In fact they even host a world championship every year in Finland where it was created. 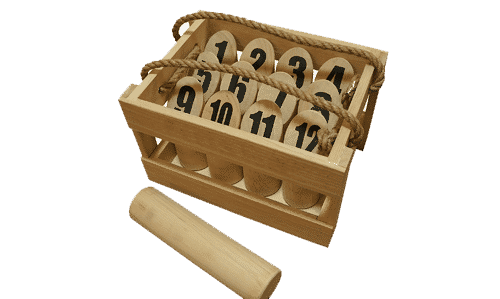 Similar to a real game of bowling you try to knock down your 12 wooden pins (skittles) by throwing a wooden pin (Molkky) at them. The wooden pins you knocked over are then placed upwards so your strategy will constantly change as the pins are rearranged. It has a point-based system that goes up to 50 and can even allow up to 26 people playing at once. So grab your favorite beverage and a handful of skittles and get ready for a fun time and what may be your new favorite outdoor game! Find a relatively flat service and take all the pins out of your crate. Take the numbered pins and set them up in the same order as below. Once this is setup you can draw your throwing line 3-4 meters (10 Feet) away. Note how it curves slightly back in an oval shape so your competitors are not leaning on direction to hit the back pins easier. To start, select your teams to play Molkky. Play Molkky with 2 to 26 players, this game is fun for everyone. Teams can be made up as either single players, couples, or pretty much as many people as you want. Normally we play 3 or 4 teams of single players, or for larger groups 4 team of couples. For the first game the throwing order is drawn or competed for. Either by random chance, rock scissors paper, or 1 throw of the pins to see who scores the most points. After the first Molkky game all following order is formed from previous game results from lowest to highest. Take turns throwing the throwing pin at the skittles lined up. Your aim is to hit the pins on your turn. If a player misses they must retrieve their Molkky and throw again. If you miss 3 times in a row (with no score) you are automatically out of the game and forced to be the scorekeeper. After throwing the skittle the pins are put into the upright position again at the same place where they fell. When you start the game, the skittles will be in perfect formation but as the game progresses the throwing field might widen as the pins are setup upright in the same spot they fell over. If one pin is knocked over you get the score for the number of that pin (#1-#12). Points are only counted when the pin is horizontal on the ground, not leaning or another pin or the throwing skittle. You must get 50 Points EXACT for the win. The real strategy of the game is to get exactly 50 points without going over. As mentioned above if you do so you will be reset back to 25. This seems easy but once you score is in the 40’s it turns into real strategy as the tricky part is hitting the specific pins you need. We created the Unofficial Backyard Game rules for turning this classic game into a Drinking Game. Here are the 7 drinking rules to follow. If playing with more than 2 people, you can choose which opponent takes a drink. You must always have a drink in your hand. So what are you waiting for? 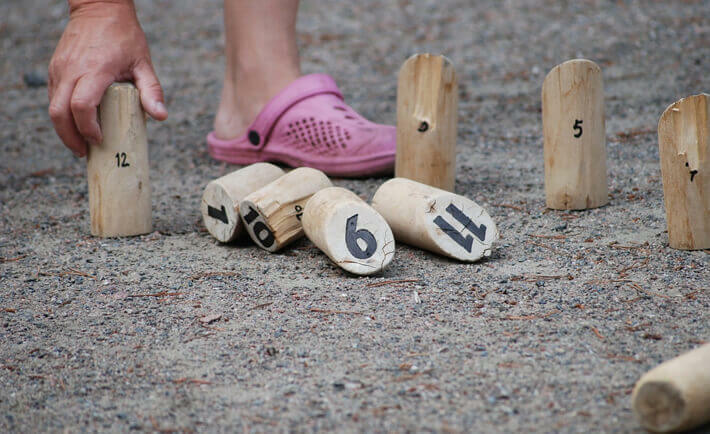 Order your Molkky game online and break it out at the next sunny day in the Backyard. 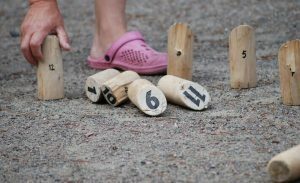 Game description: Extremely fun Outdoor Lawn Game combining both skill and luck to knock down the wooden skittles first to win the game. Molkky is one of the more skillful demanding lawn toss games that is extremely addicting. One of those games that earns the top spot in your backyard game collection. Similar to a game of bowling you try to be the first one to finish by getting to exactly 50 points first. Getting to the exact amount is one of the challenging situations you have to overcome with precise shots and smack talk.